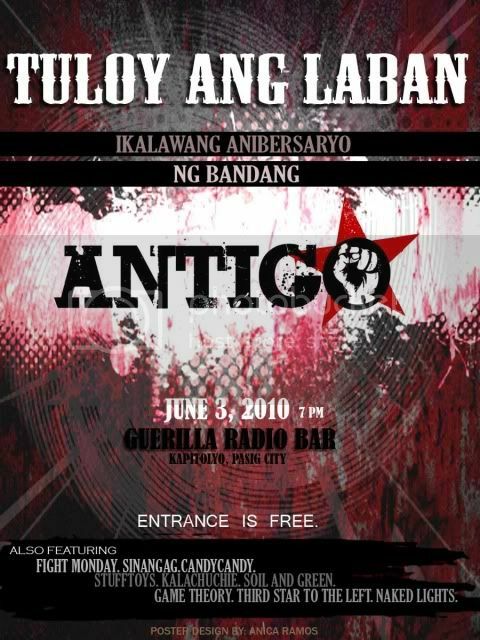 Antigo, a band formed 2 years ago with the help of our community is celebrating their 2nd anniversary and wants to invite all of you to join them in commemorating their birthday on June 3 at Guerilla Radio Bar in Pasig. Don't worry entrance if free! It's their way of saying THANK YOU! since this forum played a big part in forming the band. Other Philmusic bands are playing too! So what are you waiting for? Come and let's join us! Re: EB Announcement: Antigo's 2nd Anniversary! Everybody is welcome! up! supporta naman po mga sirs and maams.